Book now the best shore excursions in Stavanger. High quality and safety at the lowest prices. If your are looking for Shore Excursion Stavanger, book now the best guided tours at lowest price with Ancora Tours. Since 2003 we offer you official guides in english, transportation and travel insurance, all included. The highest quality at the lowest rates. Stavanger is 873 years old, with roots that go back to the Ice Age and to the Vikings. Today Stavanger is a modern and lively city. From the moment you arrive you’ll feel immersed in the friendly atmosphere with fisherman happy to offer you freshly caught shrimps, crabs and lobsters. This shore excursion in Stavanger is a great way to discover the city’s best bits. What’s eating: Smoked salmon with mustard sauce. Souvenir: Some traditional Norwegian foods such as caviar, jams, chocolate and marzipan. Our shore excursion begins in Gamle Stavanger, a picturesque and historic part of the city. Today, the white facades of the small wooden cottages are perfectly maintained and the cobbled streets a pleasure to wander through. However, before the 250 buildings were expertly restored back to their 18th century charm, this area was considered seedy and run-down. 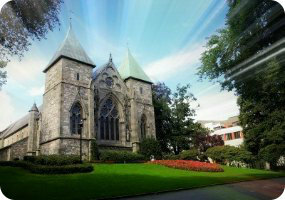 We’ll then admire Norway’s oldest cathedral, Stavanger Cathedral, which was completed in 1150. Then we head to the royal residence of Ledaal. Originally built as a summer residence for the family of local merchant Gabriel Scanche Kielland, the mansion is now used by the royal family when they visit Stavanger. The interiors have been restored to the original style of the 1850’s and now house a manor house museum. Our Stavanger shore excursion then heads to the highest point in the city, Ullandhaug Tower. From here we can enjoy a great view of the region before heading to our final stop. We’ll conclude our tour at the Norwegian Petroleum Museum. It’s unusual architecture has made this structure a landmark of Stavanger, seen from the sea this museum looks like an oil rig.